Amazon has the HS300 on sale for a discount of $25 making the final price $54.99. Limit to one per customer. 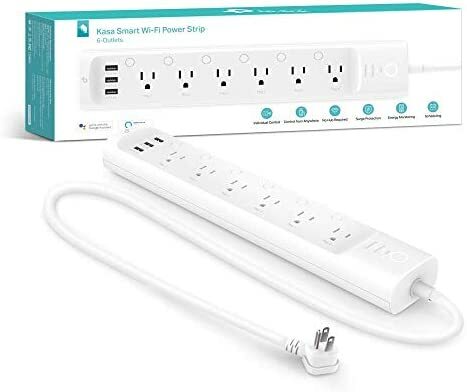 The Kasa Smart WiFi Power Strip by TP-Link HS300 is presently on sale at Amazon for $55 – normally $80. Looks like this sale ends tonight at Midnight (PST). The sale for this HS300 for $55 ends in a couple of hours. Actually ends at midnight eastern time. Keep in mind there is a quantity limit of only one per account limited by the seller (TP-Link) so if you are like me and want more then you’ll have to use multiple accounts to buy more than one. I just did two of them but had whittled my amazon accounts down to one. So I had to create another for this purpose and sign up for the prime trial. We will see if I save anything in the long run, I’ll probably forget to cancel prime before the free portion is over with. The HS300 is currently on a $69.99 sale in several places.